Diana Gudaevna Gurtskaya (Georgian :დიანა ღურწკაია, Russian : Диана Гудаевна Гурцкая, born 2 July 1978) is a blind Russian-Georgian singer. Following a failed attempt in Belarus the previous year Diana, on 1 March 2008, won the Georgian national final with 39.4% of the vote, therefore she represented Georgia at the 2008 Eurovision Song Contest in Belgrade, Serbia. She won a place in the final at the second semi-final on 22 May and finished 11th. 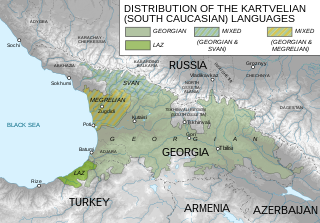 Georgian is a Kartvelian language spoken by Georgians. It is the official language of Georgia. Georgian is written in its own writing system, the Georgian script. Georgian is the literary language for all regional subgroups of Georgians, including those who speak other Kartvelian languages: Svans, Mingrelians and the Laz. There is a small Russian population in Georgia of less than 0.5% of the total population. 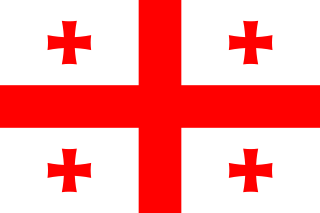 For many years, Georgia was a part of the Russian Empire, and later the Soviet Union. As the two countries share a border, many Russians settled in various regions of Georgia. In recent years, the number of Russians living in Georgia has sharply declined. Mikheil Saakashvili is a Georgian and Ukrainian politician. He was the third President of Georgia for two consecutive terms from 25 January 2004 to 17 November 2013. From May 2015 until November 2016, Saakashvili was the Governor of Ukraine's Odessa Oblast. He is the founder and former chairman of the United National Movement party. 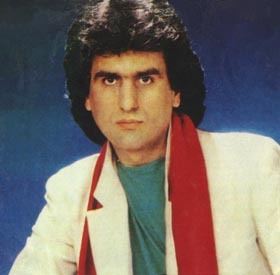 Salvatore "Toto" Cutugno is an Italian pop singer-songwriter and musician. 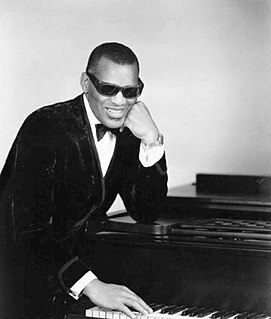 He may be best known for his worldwide hit song, "L'Italiano", released on his 1983 album of the same title. Cutugno also won the Eurovision Song Contest 1990 with the song "Insieme: 1992", for which he wrote both lyrics and music. Artemios "Demis" Ventouris-Roussos was an Egyptian-born Greek vocalist and performer who had an internationally acclaimed career, as a single recording artist and bandleader. As a band member he is best remembered for his work in the progressive rock music act Aphrodite's Child, but as a vocal soloist, his repertoire included hit songs like "Goodbye, My Love, Goodbye" and "Forever and Ever". Gurtskaya is married to Pyotr Kucherenko, who is a sighted lawyer in Moscow, and they have one son, Konstantin (b. June 2007). Tetyana Hryhorivna Liberman, known professionally as Tina Karol, is a Ukrainian singer, actress, and television presenter. She represented Ukraine in the Eurovision Song Contest 2006 with the song "Show Me Your Love", placing seventh. Karol has since become a mentor on The Voice of Ukraine. Gaita-Lurdes Essami, better known under stage name Gaitana, born on 24 March 1979 in Kiev), is a Ukrainian singer and songwriter of Ukrainian and Congolese descent. Her music combines elements of jazz, funk, soul, and folk music. Gaitana represented Ukraine in the Eurovision Song Contest 2012 in Baku, Azerbaijan. The Georgian entry for the Eurovision Song Contest 2008 was chosen through a national final on Saturday 1 March 2008. A total of 12 participants competed for the Georgian place in the semi-finals of Eurovision. The winner was Diana Gurtskaya with the song "Peace Will Come". The song finished 11th with 83 points. "Shady Lady" was the Ukrainian entry for the 2008 Eurovision Song Contest. It was sung by Ani Lorak, composed by Philipp Kirkorov and written by Karen Kavaleryan. 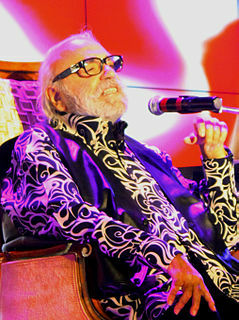 However, in Greece, around the time of the Contest, there were many rumors stating that popular composer Dimitris Kontopoulos had actually composed the song. Although his name was not credited during the Eurovision Song Contest performances, it was later confirmed that Kontopoulos was indeed a producer of the song. "Peace Will Come" was sung by blind Georgian singer Diana Gurtskaya and represented Georgia at the Eurovision Song Contest 2008. It qualified from the second semi-final on 22 May 2008 at 7th and eventually finished in 11th place out of the twenty five countries that took part. It was written by Kim Breitburg and Karen Kavaleryan. Karen Kavaleryan is a Russian-Armenian lyricist. He currently holds the record for representing the most countries in the Eurovision Song Contest with five. The countries are Russia in 2002 and 2006, Belarus in 2007, Armenia in 2007 and 2010, Ukraine in 2008 and 2013 and Georgia in 2008. Svitlana Serhiivna Loboda, also known by the stage name LOBODA, is a Ukrainian singer and composer. Loboda represented Ukraine in the Eurovision Song Contest 2009 and finished in 12th place with 76 points. Stephane & 3G are a Georgian pop group consisting of members: Stephane Mgebrishvili, Nini Badurashvili, Tamara Gachechiladze and Kristine Imedadze. Anastasia Kostyantynivna Prikhodko is a Ukrainian former folk rock and traditional pop singer, known for her deep contralto. On 16 October 2018, Prikhodko announced on Facebook that she had decided to end her musical career. At the end of October 2018, Prikhodko announced she was pursuing a national political career. Anri Jokhadze is a Georgian pop singer from Tbilisi who represented Georgia in the Eurovision Song Contest 2012 with the song "I'm a Joker". The singer is a winner and laureate of 13 international contests. Prior to his appearance at the Eurovision Song Contest 2012, Anri Jokhadze has also represented Georgia in the Eurovision Song Contest 2008 as a backing vocalist for Diana Gurtskaya and her song "Peace Will Come." Besides, he is the composer of the Georgian entry at the Eurovision Song Contest 2017, "Keep the Faith" sung by Tamara Gachechiladze. Zlata Leonidivna Ognevich, is a Ukrainian singer and a former deputy of Verkhovna Rada. She represented Ukraine in the Eurovision Song Contest 2013 in Malmö with the song "Gravity". Ognevich previously attempted to represent Ukraine at the Contest in 2010 and 2011. Ruslana Stepanivna Lyzhychko, known mononymously as Ruslana, is a World Music Award and Eurovision Song Contest winning recording artist, holding the title of People's Artist of Ukraine. She is also a former MP serving as deputy in the Ukrainian parliament for the Our Ukraine Party. Ruslana was the UNICEF Goodwill Ambassador in Ukraine in 2004-2005. She is recognized as the most successful Ukrainian female solo artist internationally and was included in the top 10 most influential women of 2013 by the Forbes magazine. The U.S. Secretary of State honored her with the International Women of Courage Award in March 2014. She has been named an honorary citizen of her hometown L'viv and was nominated to receive the title Hero of Ukraine. Georgia participated in the Eurovision Song Contest 2017 with the song "Keep the Faith" written by Anri Jokhadze and Tamara Gachechiladze. The song was performed by Tamara Gachechiladze. The Georgian entry for the 2017 contest in Kiev, Ukraine was selected through a national final organised by the Georgian broadcaster Georgian Public Broadcaster (GPB). The national final consisted of twenty-five competing acts participating in a televised production where the winner was determined by a 60/40 combination of votes from jury members made up of music professionals and a public telephone vote. "Keep the Faith" performed by Tamara Gachechiladze was selected as the winner.